Ruth has demonstrated extraordinary dedication in her quest to create the perfect water essences. She has collected water from icebergs in the Arctic, wandered the deserts of New Mexico, and stood on the tip of the Cape of Good Hope. Wherever Ruth’s journey takes her, her sole intention is to communicate with the life force of the water in that area. Ruth’s life’s work is to understand and communicate with water. She loves all parts of it: the tiny micro-organisms that live in just one drop, the huge oceans and ocean creatures, lakes, rivers, clouds, mist, rain, sleet, hale, icebergs, and glaciers. She and Graham live on the northwest coast of Ireland, where rain is plentiful. When this process is complete, Graham blows a glass vessel to hold the water essence, which is then sealed inside the glass, so they can be used as ‘wearable water’ pendants. Graham grew up in South Africa. He studied architecture at the Massachusetts College of Art, took glassblowing as an elective module, and subsequently switched to sculptural glass. 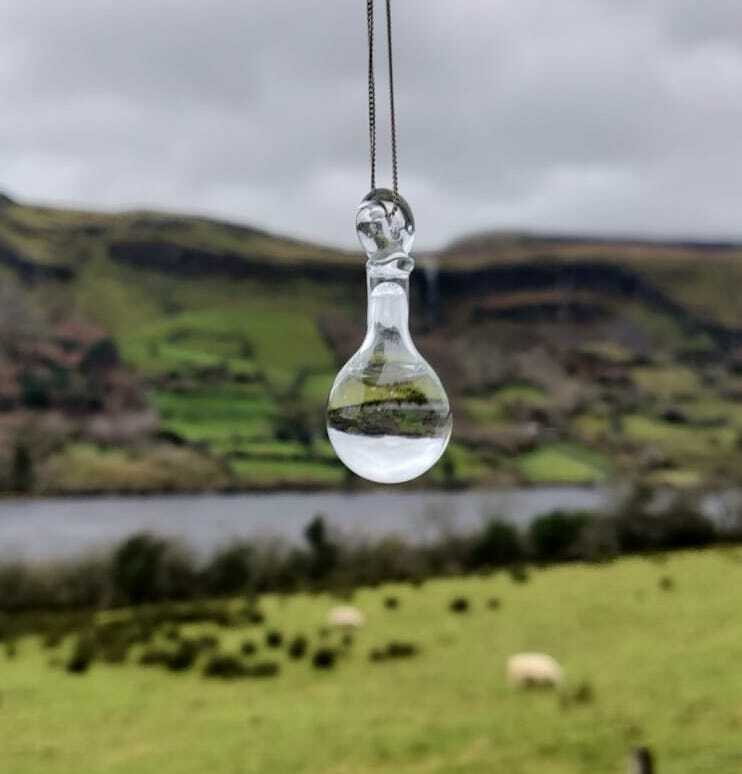 After returning to his ancestral roots in Ireland, he designed and built Knockbeg Glass Studios where he taught and blew glass under the name Glóine Eíreann. He has a flameworking and metal studio at home in Sligo. His sculptural work is primarily concerned with expressing and manifesting the universal forces that surround us, but are often invisible. Each and every glass Water Orb is handmade with love. After the orb has cooled, the Water Essence of your choice is placed in the orb and sealed inside with molten glass, which is also used to form the loop. Each orb comes on a 24″ pure sterling silver chain, and wrapped and packaged in an eco-friendly gift box. Please visit celestialaquatics.com for more information.